Our garden space is just a little limited since we don’t have a huge area to garden in. But I try to extend my growing area by growing vertically. I like to grow pole peas and beans along with cucumbers on a trellis. By growing them vertically, I can save on the amount of garden space needed to grow them. Over the years I have tried a few different kinds of trellis. We had a PVC pipe frame we would attach to the garden beds and then string up netting to grow our vegetables on. There were a few problems with this kind of trellis for us. The netting never lasted more than a year. I had to repurchase netting each year and attach it again with cable ties. The growing space was a little limited also. Some people like to use teepee poles to grow the beans on or even sunflowers. I’ve never given either one of these options a try in the past, but they might work. I think the space available to grow upward would be limited on both of these options. The trellis option we have ended up really liking is to use a cattle panel. A cattle panel is a large wire, square grid of fencing. I think they must normally be used for fencing but I’m not really sure. They do work wonderfully for a trellis though. The cattle panels we found were about 5 feet wide by about 12 feet long. We found them at a local farm and ranch store. The cattle panels we found were about 5 feet wide by about 12 feet long. We found them at a local farm and ranch store. The trellis is easy to make once you get the cattle panels home. Since our garden beds are 4 feet wide we trimmed off a foot on one side of the panel. We used bolt cutters to cut them. We purchased a 24-inch pair of bolt cutters and they worked great not only on this project but many others too. Then we measured halfway from one end and cut the panel in half lengthwise. Be sure to cut at the end of one of the squares leaving one side cut flush and the other side with the metal rods sticking out. You will want the extra metal wire sticking past the end to poke into the ground. Now you should have two panels. One panel with a flush, smooth end, and the other end, will have a pointy end to stick into the soil. The second panel should be flush at both ends. Once you have two matching panels, you’ll need to attach them together at the top, this is the smooth edge. We used hog rings to do this part. But cable ties would work too. 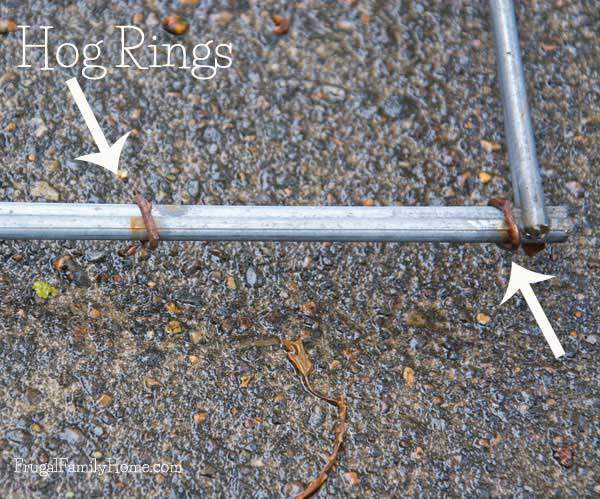 The hog rings last longer because they are metal. To add the hog rings, just crimp them around the top two bars and squeeze them shut. This makes a hinge at the top of the panels. To set up your trellis, insert the spike end into the ground straddling the plants you want to grow upright and push into the soil. 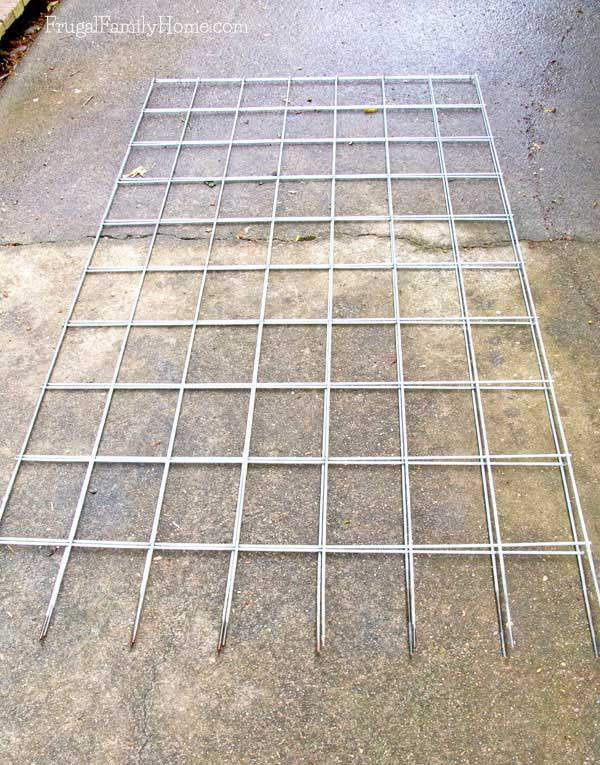 Then in the winter, these cattle panel trellis will fold flat for easy storage. That’s all there is to making a cattle panel trellis. Looking for more gardening ideas? Head on over to the gardening page for more gardening ideas and inspiration. oh this is awesome and looks so simple! 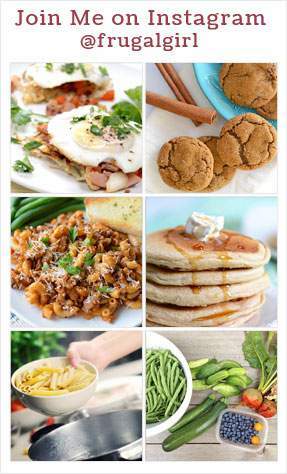 I’m showing this post to my husband…I think he would love to try this! OMG – I have been searching for an easy trellis to build! I have recently removed some invasive ivy from my fences and have built garden boxes there instead. I want to grow pole beans, but I don’t want them to grow up my fence and cause further damage – these trellises are a perfect solution! These trellis work great for pole beans. Weeding is one of the jobs I hate the most about gardening. I agree today was too hot to do much outside. Put some newspaper or cardboard on the surface to kill weeds, then the substance turns to compost. What kinds of plants do you use with the trellis? Tshanina, I grow cucumbers, pole beans, and pole peas each year on them. I have in the past, but not this year grown small pumpkins too. It really helps to conserve on space. Those look great! We use these panels for our grapes, but we’ve never welded them together. That’s a great idea. We have been using these for about 3 years now and they have held up really nicely. They work great for our peas, beans, and cucumbers. I like that when our garden isn’t being used, in the winter, we can take them and fold them up so they don’t use as much storage space. Well…I think I may be a little too lazy to clean them up in the winter 🙂 . But I think that’s why your garden always looks so beautiful. Lots of love there, it shows! My best pumpkin harvest was the year I planted next to a chain link fence; ever seen a pumpkin try to grow halfway through a link?!! That’s what I hated about nylon nets and hardware ‘cloth’: untangling the vines after harvest but cattle panels should be open enough. Oh my, I’ve never seen a pumpkin grow half way through a link. The cattle panels are really nice for picking off of and for cleaning up at the end of the season. I’ve tried nets before but I hated the clean up at the end of the season. One year I got so frustrated trying to get the dead plants off I just cut the net and threw it away. A weed torch makes short work of the clean up process in fall on the cattle panels of course. Thanks for sharing Troy. We have a weed torch I’ll have to give it a try. I usually just pull them off by hand. Thanks for stopping by Ronald. Great tips! Thanks for sharing. 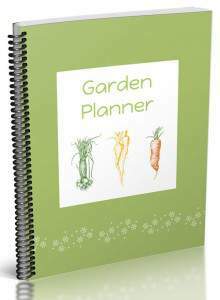 When do you start your spring/summer garden? Tamara, I’ve already started my peas, broccoli and lettuce in the garden. Usually if the weather isn’t too wet I try to start about mid February. But some years I have to wait until March. This year has been unusually warm for us. Excellent idea! Looks sturdy- have you used this type of trellis for indeterminant vining tomatoes? Do you think it will hold the weight? Thank you!! Sara, they are really quite sturdy. I haven’t tried indeterminant vining tomatoes on them before. But last year my beans grew and grew and got so thick and heavy on the frame and I didn’t have any problems. I would think they would hold the weight just fine. I think if you grow on both sides of the frame that should help distribute the weight evenly over the frame. I usually grow beans, peas and cucumbers on them. One year I did grow small pumpkins on them too. How do they hold up to the weather (ie: strong winds, storms, etc)? Do you use anything else as support, or are they just held in the ground by the end wires of the panel? Jess, I haven’t had any trouble with them during storms. We have wind here fairly regularly, and I haven’t had any trouble at all with these. To hold them in the ground I just stick the end wires of the panel all the way into the dirt. They stay in ground firmly. D0 you think these could handle the weight of cantaloupe, watermelon, and spaghetti squash? Jennifer, I haven’t tried growing watermelon, cantaloupe or spaghetti squash on them before. I have grown pie pumpkins and they did alright but they those pumpkins don’t get huge. I would think spaghetti squash would work, but I’m not sure about the melons. 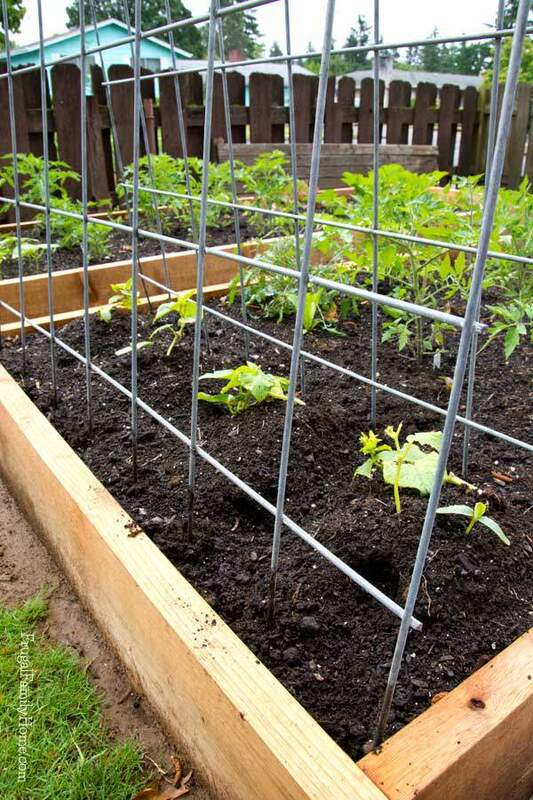 The trellis is pretty sturdy and if you train the plants so the weight is even on both sides it might work. Sorry I don’t have a better answer for you. Melissa, I would use a trellis for the beans, if you plan on growing the pole variety. They produce all season long, where the bush beans which don’t need a trellis produce one or two good harvests and then they are done. I would set your trellis up along the side of the raised bed, so that it doesn’t block the sun on the rest of the garden. I have a south facing garden area. So I plant the items I grow on a trellis on the north end of the raised bed so it only shades the grass and it doesn’t shade the rest of the garden. Tomatoes can be grown in cages or even supported by bamboo stick and then tied to the stick. If you don’t have room for a second trellis or the second trellis would shade the garden too much, I would look for a bush cucumber variety. I grow both vine and bush varieties of cucumbers. The bush variety can be grown in a smaller area and won’t need a trellis, it grows more like a zucchini plant. Peppers can be grown without any support. If they get a little tall or they start to lean in our garden, I will add a bamboo stick to support them and use string to tie them to it. Can you tell me if all hog or cattle panel comes rolled up? Is there a way to get it not rolled up? It seems hard to work with when it is rolled. 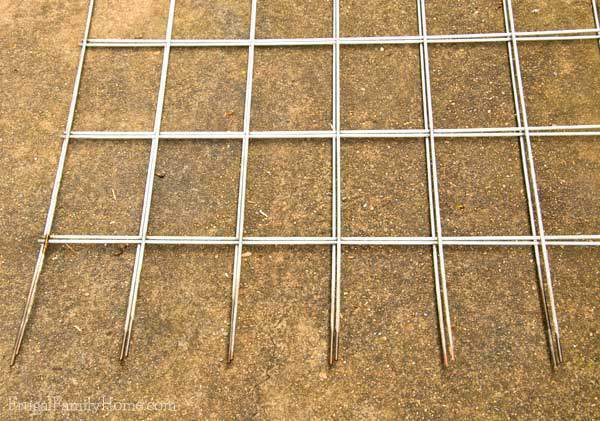 The cattle panels that I used for this project were heavy gauge wire cattle panel fencing that is purchased in a flat sheet. I purchased mine at Costal Farm and Ranch. I don’t think the rolled fencing would work for this project as the gauge of wire used in that fencing isn’t heavy enough to stand up. Let me know if you have any more questions. We are so happy to have found this solution for growing our cucumbers vertically. We bought the cattle panels at Tractor Supply. They come in flat panels, either 8 feet or 16 feet long and are 4 gauge, very heavy. We had to use a large bolt cutter to cut them. How close do you plant your plants, using this technique? I did what you did, and used cattle panels. Now I can’t decided on how close to plant the zucchini, cucumber and yellow squash. How expensive are cattle panels? I KNEW there had to be an easier way to trellis my cucumbers, peas, and pole beans – thank you so much for sharing this! I just installed some lovely redwood raised beds in my smallish Silicon Valley yard and wanted to be able to grow upwards. The wooden trellises they sell at garden centers look nice, but they just don’t look sturdy enough to last, and netting (ugh! ), just a big pain in the rear. This year I am going to try using cattle panels in several spots. Do you think it would work to put them in the ground near the base of a fence and then run a wire or cord from the top of the fence to the top of the panel that allowed the panel to lean away from the fence? (Does that make sense?). I’m thinking it would make harvesting super easy. Kate, I think that would work as long as the wire or cord is strong enough to hold the panel and the weight of the fruit. If you try it let me know how it works out. Happy Gardening! Well, the results are in – cattle panels are amazing! The Mexican Gherkins didn’t put any weight strain in the angled panels, and cucumbers, pole beans, and peas are still going strong. The structure, sunlight and air flow provided by the panels makes a huge difference! Annette, I plant them down the middle of the trellis and use mounds. I do that because our garden gets sun from one side. If you have a nice sunny spot that gets more sun, you could plant them on either side of the trellis and spread them out along the trellis. It should work well either way. I made these and am so happy. I’m just tickled pink. Thank you!!!! (p.s. I panicked when I realized I didn’t have a tool to cut the cattle panels but thankfully my country neighbor helped me out). Have a great growing season!! Yeah for helpful neighbors and I hope you have a great growing season too, Shannon! Do you orient your trellis parallel to the path of sun, or at a right angle? Jeannette, I orient them parallel to the path of the sun. Let me know if you have any more questions. So glad I found this pin. I got my panels today and looking forward to my son making the trellis. Thank you for sharing. Deidre, Your welcome. I hope the trellis work as well for you as they do at our house. We’ve been using them for years now. We use the trellis for cucumbers, beans, and sugar snap peas each year. They hold up well from year to year too. I’m so excited about this I feel like a kid in a toy store. I going to try them on my purple hull peas and I may plant some watermelons now that I can keep them off the ground. Let me know how the watermelons do. I’ve never tried to grow them since we don’t usually have a long enough season to ripen them. But one of these days I might try a variety that will do better in our area and see if I can grow a few. I hope your garden does great this year! I have used a cattle panel, divided & attached at the top for cucumbers in the past. I am wondering if the A frame configuration would work for indeterminate tomatoes. Has anyone tried this? The thing I like about these is that the metal looks heavy duty and robust. My mom used to use bamboo poles tied together with twine – those lasted only one season and then they rotted. These look like you could use them for several years. James, we also hated that our trellis would only last one season. But these cattle panel trellis just finished the 4 season and are holding up wonderfully. They are also easy to remove for storage in the winter since they fold flat. We hang them on the backside of our gazebo for the winter so we don’t have to look at them. I use mine stock panels year round. In summer, I use them for melons and cucumbers. In winter, I use them for peas. They can also provide windbreak support for when I hear of a bad storm coming. Is it necessary to store these over the winter? Any reason not to just leave them in the ground? Bob, you can leave them in the ground. I remove them only because I don’t like to look at the empty panels all winter long.